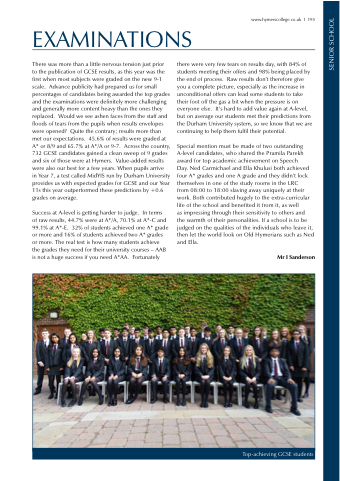 in Year 7, a test called MidYIS run by Durham University provides us with expected grades for GCSE and our Year 11s this year outperformed these predictions by +0.6 grades on average. there were very few tears on results day, with 84% of students meeting their offers and 98% being placed by the end of process. Raw results don’t therefore give you a complete picture, especially as the increase in unconditional offers can lead some students to take their foot off the gas a bit when the pressure is on everyone else. It’s hard to add value again at A-level, but on average our students met their predictions from the Durham University system, so we know that we are continuing to help them fulfil their potential. as impressing through their sensitivity to others and the warmth of their personalities. If a school is to be judged on the qualities of the individuals who leave it, then let the world look on Old Hymerians such as Ned and Ella.